_Without a solid foundation, built on rock-solid principles...the challenges that come are much more difficult to weather. Tifphanie Tucker is a woman succeeding in a man’s world; a licensed general contractor with her own construction company who has built homes for many families. She has faced challenges and obstacles that have helped her sharpen her tools of perseverance, determination and responsibility. Her experiences in the construction industry have taught her how to deal with disappointments, overcome discouragement and compete with the big dogs. 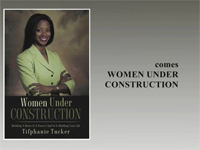 In Women Under Construction, Tifphanie Tucker speaks metaphorically about building a house and building a successful life – spiritually, personally and professionally. Learn how to use the teachings of the Bible as a blueprint to build a life that is based on integrity, self-confidence and faith. Discover the four walls of virtue and how you can use them to stand strong in the face of adversity. Learn how to write a vision plan for all the goals you wish to accomplish, and how to accomplish them. Learn how to protect the interior of your house by being around people who are successful and supportive of what you are trying to accomplish in your life. In 8 short easy-to-read chapters, Tifphanie shares how you can build your life based on rock-solid principles and a firm foundation. Without a firm foundation, everything built on top of it will crumble. _Women Under Construction will teach you how God’s Word can help you build a house that will withstand the fiercest storms of life.